Do not miss your chance to join the RUC-APS team at the next Model-It simposium in Italy! Model-It (the International Symposium on Applications of Modelling as an Innovative Technology in the Horticultural Supply Chain) will be held in Molfetta, Italy from June 9 to 12 of 2019. Deadline for abstract submission has been extended till February 22nd (full versions due on April 30th). Do not miss the February 15th deadline to submit your contribution to the Euro2019 conference, where RUC-APS organices three special sessions. When submitting your article have in mind the submissions codes. The Institute of Agricultural Research (INIA) in Chile has just released a new web-site with information about RUC-APS for the spanish speaking community. In addition, the site provides insight into INIA’s activities and results in the project. The goal of this special session is to attract representatives of industry and academia that can provide insight into the challenges and advances of effectively bringing ICT to agriculture, from the perspective of HCI. As part of his secondment to UNLP (Argentina) Amir Sakka from UT1C (France) conducted a teaching session on Group Decision Support Systems. The session was aimed at academics, researchers, and students of the Faculty of Agronomic Sciences and Forestry of the National University of La Plata. It is part of a series of activities that are central to work packages 10 and 12. The aim of these activities is to pilot UTC1 technology (the Grus system) in agriculture scenarios. The material used in this session can be downloaded in pdf form from this link. This teaching session will be followed by a hands on experiment to be conducted in the following days. This entry was posted in teaching, updates. The Group Decision and Negotiation (GDN) section of the International Federation of Operational Research and Management Science Society (INFORMS) awarded Pascale Zaraté, ADRIA team, on June 12th2018 at the University of d’Aeronotics et Astraunotics, Nanjing, China during the annual international conference GDN organized under the authority of the GDN-INFORMS section. Since 2004, this award is yearly assigned to one researcher for his/her whole activity and his/her involvement in the GDN community. Since 2004, only three women have been awarded: Prof. Katia Sycara, Carnegie Mellon School of Computer Science, USA; Prof. Fran Ackerman, Curtin University, Australia and Prof. Pascale Zaraté, Université Toulouse 1 Capitole – IRIT, France. On June 12th Constanza Jana Ayala from INIA (Chile) conducted a teaching session in the context of her secondment to CNR-ISPA (Italy). The session started with an overview of the activities of INIA, with special focus in the work conducted at the Intihuasi Research Regional Center . After a brief introduction of all participants, the session moved on to discuss artichoke production in Chile and Italy. Topics of the session included evolution of production in the region, production methods, breeding methods and main crop health challenges and approaches. During his secondment to IBSPAN (Poland), and as part of the dissemination activities of the RUC-APS project, Dr. Alejandro Fernández (from UNLP) travelled to Darmstadt, Germany. He visited the University of Darmstadt, and spent a few days of meetings and enriching discussion at KOM (the Multimedia Communications Lab). On Thursday April 26 2018, Alejandro gave a formal presentation about the project to members of the KOM research lab. The director of KOM, Dr. Ralf Steinmetz, and the director of the research area for “Educational Media and Applications”, Dr. Christoph Rensing, attended the presentation, as well as various Ph.D students and researchers. During the presentation, Alejandro provided an overview of the project (goals, consortium, and activities) and more details of the work-package 10, lead by UNLP. He specially asked the audience to provide feedback regarding their experience in innovation for domains such as agriculture, and product design. This resulted in a series of very interesting talks and meeting for the next day. To conclude the presentation, Alejandro suggested attendees to consider Risk and Uncertainty in Agriculture as a potential domain for their innovations. We hope that future projects can count with the contribution of KOM. RUC-APS thanks TUD, and KOM for their hospitality and insightful feedback during Alejandro’s visit. Agri-Food supply chains can be seen as a complex network of large, medium and small producers (who grow and trade food commodities), processors (who process, manufacture and market primary and value added products), distributors (such as wholesalers and retailers that market and sell the food), consumers (who shop, purchase and consume food) and government/non-government organisations (who establish regulations that control the agri-food supply chain). However, growing world population, dynamic market demands, high product variety, low understanding of regulations across countries as well as the need for maintaining high standards in food growing and production are sources of uncertainty which imply a management challenge for reducing cost and waste as well as for balancing food supply and demand. Thus, collaboration among stakeholders along the agri-food supply chain is more important than ever, and the right application of operations management concepts will help to oversee the key information flows across the entire agri-food supply chain, which will guarantee an efficient decision-making process for food growing and production with a view to meeting end-customers’ specifications and satisfaction. From this, development and re-design of agri-food supply chains will emerge, by linking relevant inputs, outputs and processes to key agri-food supply chain aspects such as continuous improvement, cost reduction and minimized imbalance between supply and demand. This will lead to the creation of a more productive and sustainable agri-food supply chain system, able to mitigate risks and uncertainties. Therefore, the study and contribution on operations management and collaboration in Agri-Food Supply Chain Systems is presented as a multi-disciplinary theme of contemporary interest and useful for both the industry as well as the academic research area, with applications in several sectors, such as: agronomy, food manufacturing, transport and logistics, strategic planning, health, legislation, marketing, economy, supply chain management, knowledge management, risk and uncertainty, innovation and ICT-based decision support systems. How are the variety of stakeholders in the agri-food supply chain affected by regulations, prices, business management and food-safety related issues? How can growers and producers collaborate to reduce costs and prices in the agri-food supply chain, whilst providing safe, nutritious, accessible and affordable food to consumers? In conditions of information uncertainty, how do management decisions affect food quality and waste? How can information systems mitigate the problem? How can operations management contribute to customer satisfaction in agri-food supply chains? What benefits can agri-food operations management deliver for sustainable food transport and logistic whilst reducing food waste? Contributions are expected on research that stems from an industrial need and can guide the activities of managers and future researchers. Theoretical contributions without management implications, will normally not be considered. This is an open call for full papers. High-quality papers from EURO2018 and PRO-VE 2018 will be selected by the Scientific Committee to be extended and submitted to this call, for review. Interested in submitting a paper? Today, April 24th 2018, a very interesting congress on olive oil from Basilicata organized by ALSIA. Best oils will get a prize. Very interesting the relation between consumption of extra vergin olive oil and health. 57 olive oils from the Bassilicata region participate in this event. They will compete for the prize of “best single-variety”, “best in biological production”, “best label”, “best among large producers”, and best among “emerging oils”. On 19 March 2018, the RUC-APS team from University of Plymouth (Carmen Lopez, Guoqing Zhao & Huilan Chen) and from National University of La Plata (Susana Gamboa & Mariana del Pino) visited Serviverde, in La Plata, Argentina. Serviverde is a large producer of vegetables in the area of La Plata. The staff of Serviverde showed us a number of tomato, eggplant and broccoli greenhouses, and then the water system they used. After that, UoP team shared their experience based on their secondments in different countries: A detailed explanation of how to build relationships with agricultural research institutions and how to establish cooperative relationships with different farmers in some European countries. The CEO of Serviverde, Damián Simonetti, also shared their experience on how they exchange knowledge with different farmers and how they build collaborative relationships in the area of La Plata. Furthermore, a number of risks and uncertainties in the agricultural sector were also discussed during the meeting. RUC-APS organizes a special track on “Advances and Challenges in HCI in Agriculture” at Interacción 2018, in Palma, Spain. The goal of this special session is to attract representatives of industry and academia that can provide insight into the challenges and advances of effectively bringing ICT to agriculture, from the perspective of HCI. The session is organized by members of the H2020 RUC-APS project (www.ruc-aps.eu), whose goal is to enhance and implement knowledge based ICT solutions within high risk and uncertain conditions for agriculture production systems. Paper submission is now open (till April 15th) . Cardiff, UK, 17-19 September 2018. RUC-APS organizes a special session on “Cognitive Systems in Food and Agribusiness Value Chains” at PRO-VE’18. This session is focused on papers addressing research and applications in the food value chain and in agribusiness. The objective is to present interesting research and practical developments to address the challenges in the sector and to present innovative approaches and new business models for the new scenarios on the coming years. This session also addresses several aspects covered by H2020 RUC-APS project (www.ruc-aps.eu) a H2020 Rise project devoted to “Enhancing and implementing Knowledge based ICT solutions within high Risk and Uncertain Conditions for Agriculture Production Systems”. Abstract submission is now open (till March 11th) . 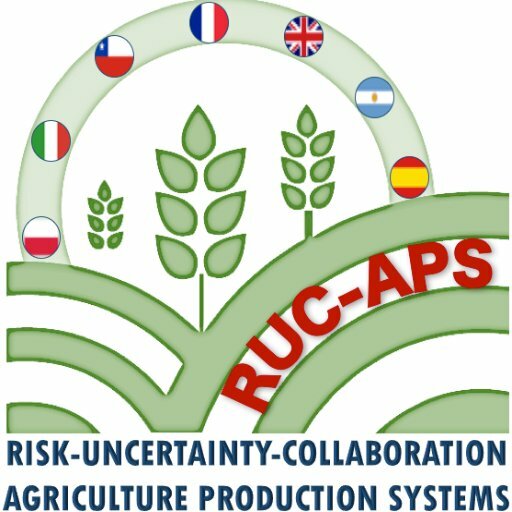 RUC-APS organizes a special stream on “Operational Research Advances in Agribusines” at this year’s Euro 2018 . This special stream will have the objective of exploring and gathering the state-of-the-art on conceptual and applied interoperable solutions to support Agriculture decision-making once facing uncertainty and risk. This will include the use of OR with application to ICT, simulations, data analysis, precision farming and innovation approaches in agriculture that will help agriculture stakeholders improving their performance and supporting multidisciplinary and collaborative solutions in Agriculture production systems consider the current socio-economic trends and challenges in Agriculture. Abstract submissions is now open (till March 5th). Agrifolgio is the monthly newsletter of ALSIA (Lucan Agency of Innovation and Development in Agriculture). Each month, Agriflogio publishes a new issue covering regional news regarding sustainable agriculture. We are proud to announce that the January 2018 issue of Agrifoglio includes an article featuring RUC-APS. We encourage you to read the complete issue (in Italian) from the newsletter’s home page . The PRO-VE conference took place from September 10th to 20th, in Vicenza, Italy. This edition of PRO-VE (the 18th) was dedicated to the topic of “collaboration in a data-rich world”. In that context, RUC-APS hosted two special sessions. The goal of this special session was to explore and gather the state-of-the-art on conceptual and applied interoperable solutions to support Agriculture decision-making once facing uncertainty and risk. The Semantic Web as a Platform Against Risk and Uncertainty in Agriculture. Challenges and Solutions for Enhancing Agriculture Value Chain Decision-Making. A Short Review. Jorge E. Hernandez, Janusz Kacprzyk, Hervé Panetto, Alejandro Fernandez, Shaofeng Liu, Angel Ortiz et al. This special session addressed research and applications in the food value chain and in agribusiness. The objective was to present interesting research and practical developments to address the challenges in the sector and also to present innovative approaches and new business models for the new scenarios on the coming years. Intelligent Food Information Provision to Consumers in an Internet of Food Era. During and after the sessions, members of the RUC-APS team had the chance to exchange knowledge with attendees, disseminating the activities of the project and learning from related research. On 26 September 2017, the RUC-APS team from University of Plymouth (Shaofeng Liu, Lynne Butel, Huilan Chen & Guoqing Zhao) and from National University of La Plata (Susana Gamboa) visited Langage Farm. The Director of the Langage Farm, Paul Winterton, met with RUC-APS team and gave the visitors a wonderful tour around the Farm and its Anaerobic Digestery (AD) facility generating electricity from food waste which supplies the Farm and Dairy with its energy needs. The RUC-APS team are delighted by the Langage Farm’s sustainable, closed-loop agricultural production system (the eco-system includes dairy farm, dairy products manufacturing and AD system). For more details about the eco-system, please visit Langage Farm’s website. As part of his RUC-APS research stay at the University of Liverpool, Alejandro Fernández (researcher from the Faculty of Informatics at the National University of La Plata) visited LEAF. The maim goal of the visit was to learn about LEAF’s approach towards sustainable farming. Meeting topics included LEAF’s IMF wheel (Integrated Farm Management method), and the role if information technologies in informed, participative decision making. The visit was also key to plan follow-up activities by both organisations. Such activities will take place during a visit that LEAF members will conduct in La Plata, in November this year. CONCYT is the International Scientific and Technologic Congress of the Buenos Aires Province (Argentina). It is organised by the Scientific Research Commission (CIC) of the Buenos Aires province. Researchers, entrepreneurs, government representatives, and the general public attend CONCYT every year to learn about the advances produced by the many research centres that constitute the CIC. This year, the National University of Quilmes hosts the fourth edition of CONCYT. The CIC associated research centre LIFIA of the University of La Plata (UNLP), participated in CONCYT. RUC-APS was one of the central projects presented by LIFIA. Being the Buenos Aires province one of the principal locations for Argentinean agriculture, this congress represented an important opportunity for RUC-APS to raise awareness about its proposals to deal with Risk and Uncertainty in Agriculture. RUC-APS RESEARCHERS FROM UK, SPAIN, ITALY, AND CHILE MEETS IN VALENCIA TO GATHER NEW CHALLENGES IN AGRIBUSINESS VALUE CHAINS. What happens when agricultural production is greater or less than expected or when the quality of the product is manifestly deficient?. These are some of the questions that were intended to be covered in this multidisciplinary RUC-APS project H2020 that seeks to innovate in the generation of solutions to the problems arising from the uncertainty in the value chain of the International agriculture. The meeting was held at the Universitat Politècnica de València (UPV) on June 27th, 2017. ….”Many times the obtained harvested crops are not what they were planned, neither in terms of quantity nor in quality, and while the market demand continues requesting a high variety of products, the key issue still remains on how linking both supply and demand so that waste and cost can be minimised as much as possible“…. As part of the Rucaps European program based on the exchange of expertise, Bretagne Développement Innovation welcomed two Spanish researchers. Llanos Cuenca and Andres Boza are both specialized in mathematical modelisation. After being welcomed by Guillaume Rostoll (CEO of Terre d’Essais), they visited the organic vegetable experimental station of Pleumeur-Gautier on June 15th. The aim of the visit was to analyze the vegetable value chain and propose modelisation tools to limit farmers’ risk-taking. A new European project could come up from this initial contact. On May 4th, 2017, researchers from the University of Plymouth, FEDACOVA, AINIA, and Bretagne Development Innovation visited the offices of VA-ASAJA (Asociación Valenciana de Agricultores) to learn about its key rol defending the interests of valencian farmers at the local, national and European level. Read more here (in Spanish). Emilie Faucheux and Sébastien Châble from Bretagne Développement Innovation (BDI), have been at the University of Liverpool Management School on a secondment, participating in the multidisciplinary H2020 project RUC-APS lead by Dr Jorge Hernandez. On April 6th 2017, María Teresa Pino from INIA (Chile) was invited as a panelist at the Silicon Valley Forum 2017 by the Office of Outreach and Partnerships (ORP) of the Interamerican Deployment bank IDB USA. The presentation can be downloaded from the Communication Material section of this web-site.